He said authorities will evaluate their readiness each day and if there is any risk will not proceed. Authorities are still determining the best way to get the team out of the cave, options that include diving. Thai authorities are working to with navy SEALs to run a fiber optic internet line into a flooded cave in northern Thailand where 12 young soccer players and their coach are trapped. In latest videos released by the Thai navy, the boys and coach say they’re fine. The group entered the cave in northern Thailand on June 23 before flooding cut off the main entrance. Rescuers are studying how to extract them safely. 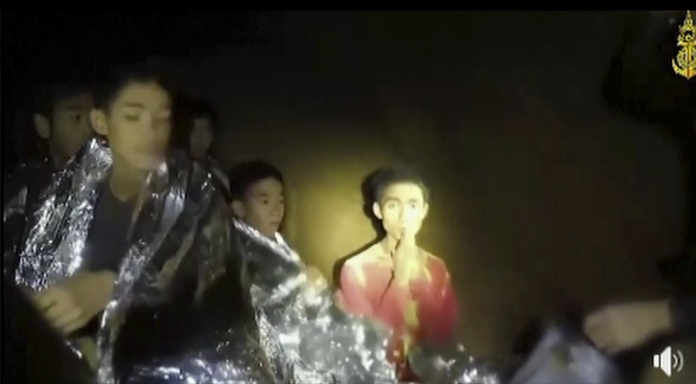 Thailand’s navy is continuing to release videos of the young soccer players trapped in a flooded cave in northern Thailand. Other boys are seen sleeping under foil warming blankets. The Thai official overseeing the rescue operation of a soccer team trapped in a flooded cave says the boys have been practicing wearing diving masks and breathing. Officials have said that teaching the 12 boys and their coach to dive may be the only way to get them out of the cave, but other options are being explored. Chiang Rai provincial Gov. Narongsak Osatanakorn said Wednesday that while the team has been practicing with masks, he doesn’t believe they have attempted any practice dives.